How many fashion shows have you been to which make you leave with a broad smile on your face? Roli and Saurabh showcasted their collection in basic Satins. For a while we all started believing that florals have lost the fringe and that lace work has overcome satin. For the designers, this was old story. Not being afraid to bring back satin, the duo submitted thread work of floral designs on satin. Frida Kahlo (mexican painter, best known for her self-portraits) who had both humor and craziness in her, along with having an extensive love of traditional and colorful clothes inspired the RSVP collection. To begin with the gowns, the designers didn't get into forming victorian gowns but rather focused on the simple diva ones. Not being too huge and complicated to handle, the gowns had the wow factor in them. They had elegant thread work done on them. Colors used for the the thread work were bright and contrasting with the satin cloths. The gowns made up of net material gave a delicate look. Gowns made up of cotton material were so light and pretty that in the first glance, you will not be able to differentiate between them and the maxi dresses. The blazers consisted of subtle colors like white as the base and to top it up, thread work of floral designs was put. Some of the outfits were blustery like the pallazo pants. The loose pallazos were styled with the tight fitted tops. It gave a vintage yet classy look. The flirty dresses had deep back necklines surrounded by yet again floral work. The skirt had flares on one side which gave an edge to the whole outfit. Overall the collection was pleasurable, sophisticated and magnificent. I would also like to mention that the whole fashion show was surprisingly was jolly and uplifting. One of the best fashion shows I've ever attended. @Caroline just saw your comment. Thanks a lot for the appreciation. 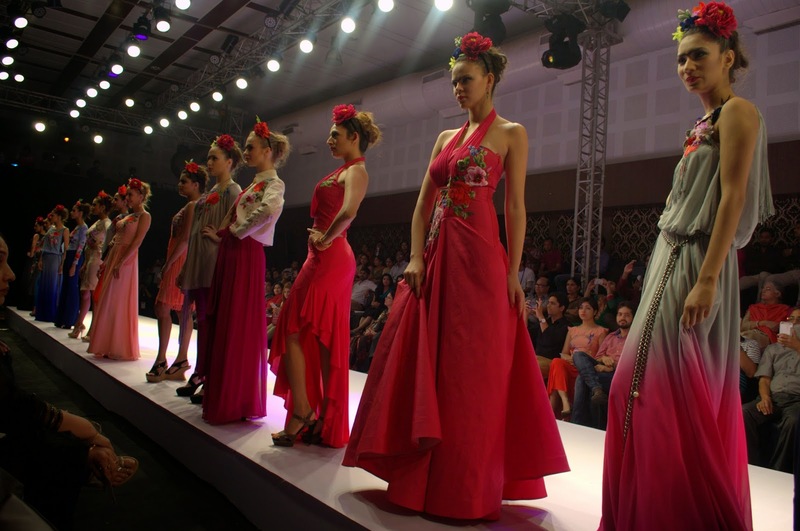 India Runway Week: W for Women Fashion Show. Wella Color Up Your Life: Bloggers Meet.